L Mathieson, M Sennaraj. Cellos: N Carmichael, J Aung, N Koshy, A Kirby, E Gooch, A Cassim. Bass: J Pearson. Flutes: S Schellingerhout, S Krishnan, G Wood. Oboe: W Foster. Clarinets: W Faulkner, C Taylor, C Couper. Bassoon: I Cowell. Horns: F Robson, A Gupta. Trumpets: J Thomas, H Marsden, E Powell, W Thacker. Trombone: K Dave. Percussion: T Maguiness, J George. WIND BANDS FORTY YEARS ON! 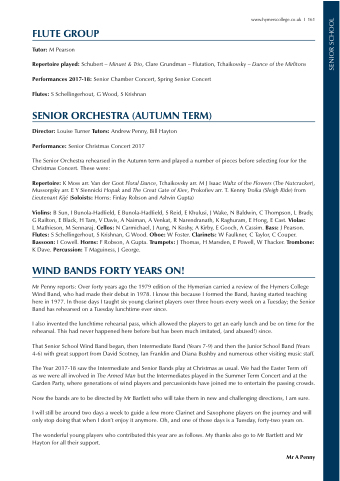 Mr Penny reports: Over forty years ago the 1979 edition of the Hymerian carried a review of the Hymers College Wind Band, who had made their debut in 1978. I know this because I formed the Band, having started teaching here in 1977. In those days I taught six young clarinet players over three hours every week on a Tuesday; the Senior Band has rehearsed on a Tuesday lunchtime ever since. I also invented the lunchtime rehearsal pass, which allowed the players to get an early lunch and be on time for the rehearsal. This had never happened here before but has been much imitated, (and abused!) since. That Senior School Wind Band began, then Intermediate Band (Years 7-9) and then the Junior School Band (Years 4-6) with great support from David Scotney, Ian Franklin and Diana Bushby and numerous other visiting music staff. as we were all involved in The Armed Man but the Intermediates played in the Summer Term Concert and at the Garden Party, where generations of wind players and percussionists have joined me to entertain the passing crowds. Now the bands are to be directed by Mr Bartlett who will take them in new and challenging directions, I am sure. I will still be around two days a week to guide a few more Clarinet and Saxophone players on the journey and will only stop doing that when I don’t enjoy it anymore. Oh, and one of those days is a Tuesday, forty-two years on. The wonderful young players who contributed this year are as follows. My thanks also go to Mr Bartlett and Mr Hayton for all their support.